Kentwood Players will present “Sordid Lives” by Del Shores from July 11-August 16 for a six-week run on Fridays and Saturdays at 8 p.m. with Sunday matinees at 2 p.m. at the Westchester Playhouse, located at 8301 Hindry Ave. in Westchester. 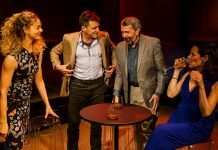 The production is directed by Kirk Larson and produced by Lori Marple-Pereslete and Virginia Mekkelson by special arrangement with Samuel French, Inc.
“Sordid Lives” premiered in Los Angeles on May 11, 1996 and ultimately won 14 DramaLogue Awards. The black comedy about white trash centers on a colorful family from a small Texas town who must come to grips with the accidental death of the elderly family matriarch during her clandestine meeting in a seedy motel room with a much younger, married neighbor. The woman’s family must deal with their own demons while preparing for what could be an embarrassing funeral. This play is filled with adult situations and language. 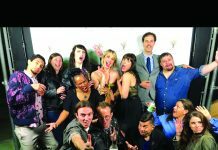 Featured in the cast are Greg Abbott, Samantha Barrios, Elizabeth A. Bouton, Harold Dershimer, Kip Hogan, Alison Mattiza, Eduardo Mora, Cherry Norris, Eddie “Ed” O’Brien, Dave Parke, Catherine Rahm, Michael Sandidge, and Susan Stangl. Tickets are $20 with a $2 discount for seniors, students, servicemen, and Metro riders who present their monthly pass or TAP card when purchasing full price tickets at the box office. To purchase tickets by phone, persons interested can call (310) 645-5156 during box office hours, Wednesday through Saturday from 4 to 7 p.m. Visa, MasterCard, and American Express accepted. 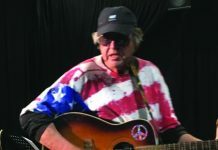 Tickets can also be purchased online at www.kentwoodplayers.org. 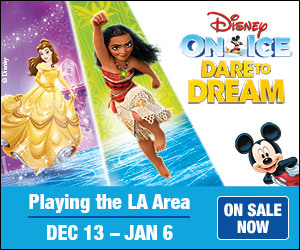 For group ticket sales, persons interested can call the box office or Lori Marple-Pereslete at (310) 216-9094. For more information about Kentwood Players including our current production or upcoming auditions, and our Kentwood Kids Children’s Theatre classes and productions, visit the Kentwood Players website at www.kentwoodplayers.org. You can also find Kentwood Players information on Facebook and Twitter. To meet the “Sordid Lives” production team and learn more about Kentwood Players and what goes on at the Westchester Playhouse, the public is invited to attend the general membership meetings, which are free and hosted on the third Wednesday of each month at 7:30 p.m. at the Westchester Playhouse, located two blocks west of the San Diego Freeway and two blocks north of Manchester at 8301 Hindry Ave. in Westchester. Photo Courtesy of Shari Barrett. 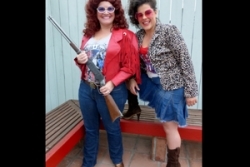 Noleta and LaVonda go all Thelma and Louise as interpreted by left: Elizabeth A. Bouton, Samantha Barrios.